The Treasury yield curve has continued its relentless flattening. The 5-/10-year slope has hit a new post-crisis low. We should not be too surprised by a flattening yield curve during a hiking cycle, but at the same time, the pace of rate hikes has been laughable. I have not been doing a lot of business cycle watching recently. I could easily be missing something significant. 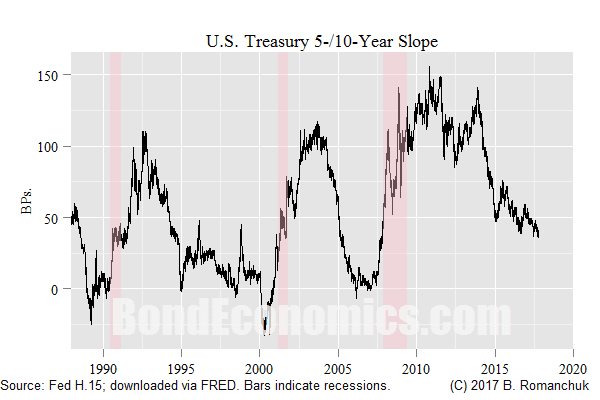 However, I would tend to interpret the yield curve action as a form of capitulation. An investor can only stand being in negative carry positions for so long. The flattening in the 5-/10-year curve (for example) is just a writing down of forward rates to levels that are are closer to what has been realised over the past half decade. In any event, the curve is still not that flat in absolute terms; it is only near what used to be considered normal in the Japanese curve. As always, the big question is: are we near a recession? Modern recessions are the result of collapse in misguided fixed investment. (Historically, the inventory cycle was enough to trigger a recession.) One of the advantages of our tepid growth environment is that fixed investment growth has been tepid, and so there is less need for it to be slashed. There certainly has been a lot of stupid investor behaviour on display, but this stupidity has largely been an equity investor affair. Creating crypto-currencies generates a lot of headline chatter, but there is not a whole lot of jobs or fixed investment being deployed. I may comment later on the fixed income pricing aspects of yield curve analysis, but that will be delayed. I first want to write an article about analysing the Job Guarantee, which got sidetracked by money discussions (sigh).